Planting by the moon or planting crops according to the phase of the moon is an ancient practice continued today by modern gardeners. Although some scientists dispute its effectiveness, even Thomas Jefferson was persuaded to try planting by moon phases. He didn't find it particularly effective at his Monticello gardens, but perhaps you will have better luck than he did. How can the phases of the moon affect growing cycles of plants? The theory behind planting according to the phase of the moon hinges on the moon's influence on water. The pull of the moon's gravitation field influences the ebb and flow of the tides, producing high and low tide and seasonal changes in the earth's oceans. 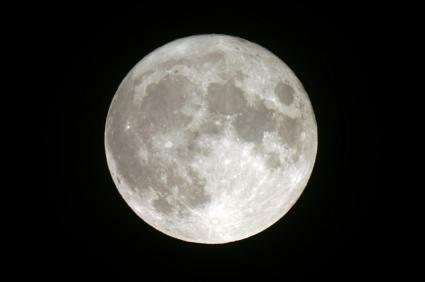 Many people believe the moon may also affect the water in the cells of plants just as subtly, encouraging them to grow vigorously during certain moon phases. Other aspects of planting by the moon include knowing when the moon passes through certain constellations. This combination of astrological and lunar planting is what most people mean when they talk about moon phase planting. Although this ancient practice was passed down orally among gardeners and farmers for centuries, it wasn't until 1952 when Maria Thun of Germany did a formal study on the effects of planting crops according to moon phases. Her conclusion was that root crops such as potatoes did indeed flourish when the moon was in Taurus, Capricorn or Virgo, the three Earth signs of the zodiac. To begin planting your crops according to moon phases, you'll need a good almanac. Gardeners trust the Farmer's Almanac. This venerable publication, available at newsstands nationwide each year and online, offers monthly planting advice according to moon phases. You'll know when to plant root crops, seedlings and seeds, when to harvest, and more. It's inexpensive in print or you can access each month's planting guide online. Another more recent publication is Ed Hume's Gardeners Almanac. You can learn more on the Ed Hume Seed Company website. This almanac also includes chores for indoor plants, too. When the moon's light is increasing, and the moon phase is moving from new moon to the full moon, you can take care of chores such as repotting houseplants and seedlings, sowing seedlings outdoors, fertilizing plants and planting trees. It's also a good time to graft rose bushes, fruit trees, and any plants you can propagate by grafting. Root leaf cuttings too during this cycle. When the light of the full moon fades, and the moon phase is progressing from full to new moon, that's the time to focus on underground chores and root crops. Plant bulbs, tubers, and any root crops. It's a good time for insect control methods, weeding and pruning. More advanced techniques of moon phase gardening talk about specific plants, seeds and tasks to perform during moon phases and when the moon progresses through certain zodiac signs. Planting by the Moon, a site detailing aspects of moon phase gardening. The Gardeners Network, information on moon phase gardening. Gardening by the Moon, which talks about the importance of the full moon.